This short pamphlet of less than 150 pages is available at no cost in E-Book PDF format, as well as in hard copy. The Project On Government Oversight (POGO) maintains and extensive web page here, and this page is adapted from it. 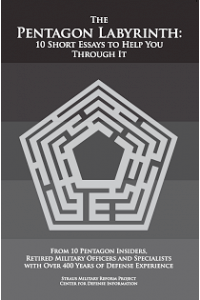 Included in the menu below are links supplemental/supporting information (much previously unavailable on the web) describing how notions of combat effectiveness relate to the basic building blocks of people, ideas, and hardware/technology; the nature of strategy; and the dysfunctional character of the Pentagon’s decision making procedures and the supporting role of its accounting shambles. This pamphlet aims to help newcomers and seasoned observers grapple with the problems of national defense. Intended especially for readers who are concerned about the superficial nature of the political debate on national security, this handbook assembles the insights of ten professionals, each with decades of experience in the armed services, the Pentagon bureaucracy, Congress, the intelligence community, military history, journalism and other disciplines.